The reason why promoters love using Sonicbids so much is that it allows us to discover great new talent while streamlining and simplifying our workflow. Understanding a promoter’s perspective will help you strengthen your EPK and get booked for more shows and opportunities through Sonicbids. In order to filter down the quantity of applications we receive, the two main things we’re looking for you to demonstrate overall in your EPK are that you’re a quality artist and that you’ve provided us with the necessary tools to successfully promote you. That being said, make it a top priority to only include your best materials and to always keep your EPK up-to-date. After you submit to a gig listing, your EPK is added to our application inbox and highlighted yellow until we review it. Part of our agreement with Sonicbids is that we must review each and every application, so don’t worry – you will be heard, seen, watched and read about before we make a final decision. 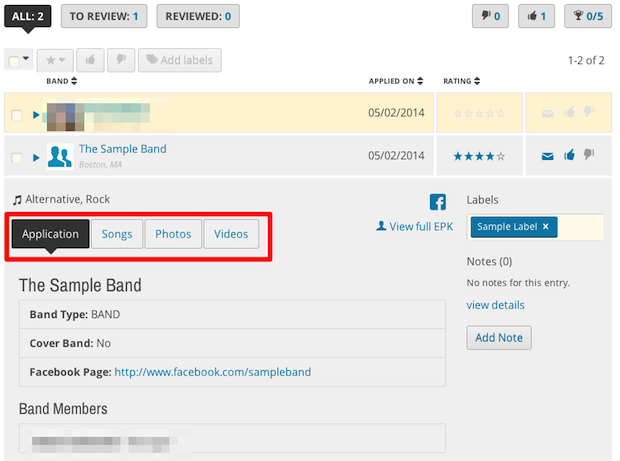 Once we click on a submitted artist, a partial EPK is expanded with multiple tabs that include the application you filled out, plus your songs, photos and videos. The application inbox is generally where 90% of the decision making process occurs, because it’s easy for us to go back and forth between artists without ever leaving the page. Before we ever read your bio, look at your photos or watch your videos, we want to hear what you sound like! Your music is the most important element of your EPK, so make sure your musical style and songs fit the intention and production of the gig opportunity. It’s natural for us to play the first song first on your EPK, so put your very best three songs at the top of the list in order. Not sure how to rank your songs? Turn to fan feedback, purchase history, production quality or feeling to help you decide. Keep in mind that we listen to a ton of music every day, so we can generally we get a good feel for your songs in 30-90 seconds. If we like what we hear, we go to track two, and if it’s as good as the first, you’re onto the next step! If the second track doesn’t grab our attention, we’ll give track three a listen. If two of the first three tracks are not what we expect, this usually leads to the end of the road. We may or may not take a listen to additional tracks, but there’s no harm in including them because they could come into play later during the selection process when deciding between final bands. If your songs pass the test, we immediately move on to view your videos. We all know there are plenty of bad videos out there with distorted audio, a person’s head in front of the camera, or a super shaky hand holding a cell phone camera, so be diligent when selecting which videos to share and only publish videos that are favorable to you. Since we don’t have the opportunity to see every act in person before booking them, I would strongly recommend putting a video of a live performance first. This is very important to us for booking because it shows that you can back up your studio recordings with a great live performance, which once again is why we are looking at you in the first place. If you don’t have one, work really hard on getting one ASAP. Some of the best filmed live performances are interview style where a video/podcast/blog already has the gear and setup to get great video, proper lighting, angles and quality audio feeds. The second video should be a music video if you have one. If selected, we will use this heavily to promote you on our website, social media, etc., so having an interesting video goes a long way! 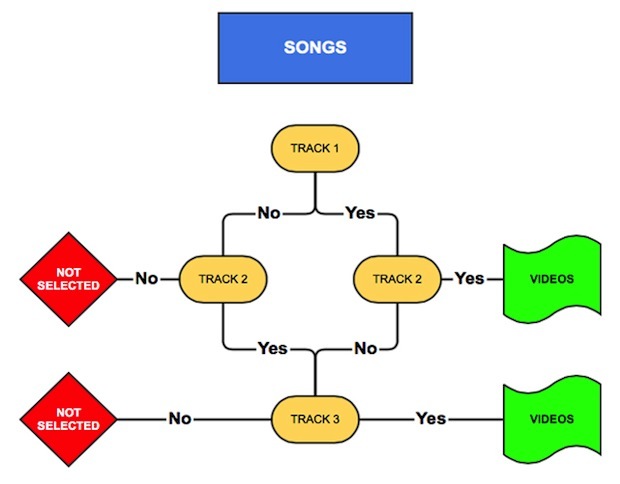 If you don’t have an official music video for any songs, then keep to a few of your best live videos and order them the same way as you did your songs. Online presence can make up huge gains for the lack of a strong video or no video. We’ll view your website, Facebook page and other social media links to help us get a sense of your fanbase. If you have no (or low quality) videos and no website or social presence, you move to the back burner, and your chance of selection is super slim. If you made it this far through the review process, chances are good that you have a press photo, but we check anyway. Your press photo should be the very first image we see since this is the one that would potentially be posted all over the place. We look at the quality of the photo, whether the artist’s image matches the style of music, and whether the photo pleasing to the eye. Remember that a picture is worth a thousand words and helps visually describe you and your music. In addition to a press photo, it’s a good idea to also have a few high quality live photos that capture your energy, emotion and onstage performance. If we’re reading your bio at this point, then you’ve made it further than most other bands. Where the bio really comes into play is promotion – it gives us a way to describe you to the public. Keep it short and sweet, because even the public is not going to sit down and read about you unless your music has got them interested. The better your bio is, the more it helps us, because we can copy and paste info to distribute through our various promotional channels. Once we’ve determined that you’ve met or exceeded our expectations, we’ll check out your calendar to find out the types of venues you play and how active of a performer you are. A consistent schedule means more to us than a few one-off big festivals or venues, because the more you play, the more you build your following and improve your stage performance. It’s crucial to keep your calendar up-to-date so that we can figure out if it’s realistic for you to make our performance date with your current routing, or if another date works better. If you have a solid EPK, you’ve probably already invested in quality song production, videos, photos, web design, etc., and good press stems from the fact that you’re doing things right. But don’t worry – if you have an awesome EPK and no press just yet, you still have a great shot at getting booked. 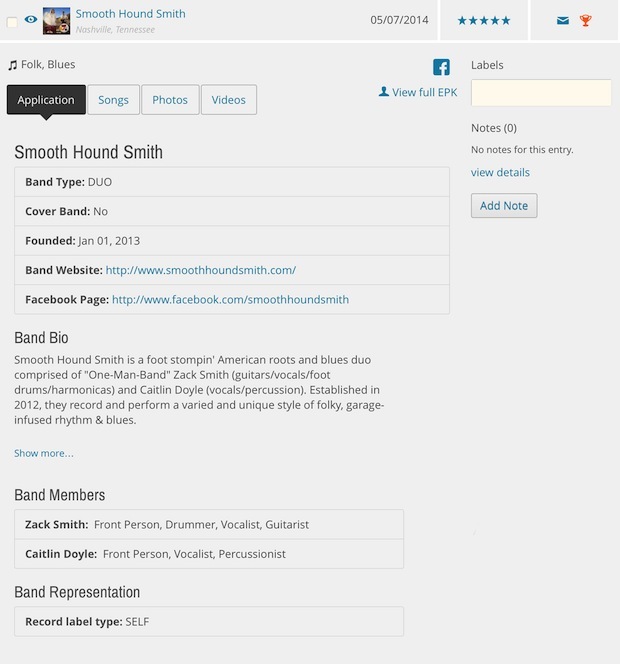 Hopefully this insight will help you spruce up your Sonicbids EPK and maximize your opportunity to get selected for gig listings on Sonicbids. Remember that every promoter is different, but the core principles of reviewing an artist’s EPK are very similar. Feel ready to start booking gigs?